Pretty and simple single flower pin. 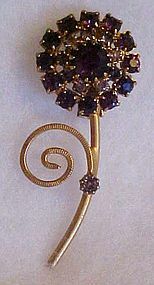 Purple and clear prong set rhinestones in a gold tone setting. Measures 2 1/4" tall and is in nice condition with all stones intact. Pinback works well too. Unmarked, unsigned.